I almost didn't make this post because I nearly fell asleep with LO when I put her to bed. 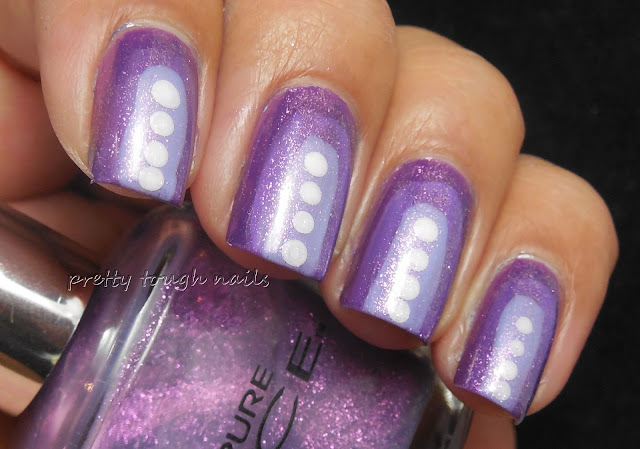 I persevered and dragged myself out of bed to get this violet themed mani up for you and complete day 6 of the 31 Day Challenge. Aren't you proud of me? I think I deserve a toast for that.... where's my margarita? I've been seeing ruffian rainbow manicures sporadically and thought it would be nice to try a gradient rainbow using the ruffian technique. I started with a dark purple, Matesse Elite Pumped Up Purple. It took two coats of semi-opacity and applied streaky. I didn't dwell too much on that though because I knew I was covering that up with a medium shade of purple, Color Club Puccilicious. 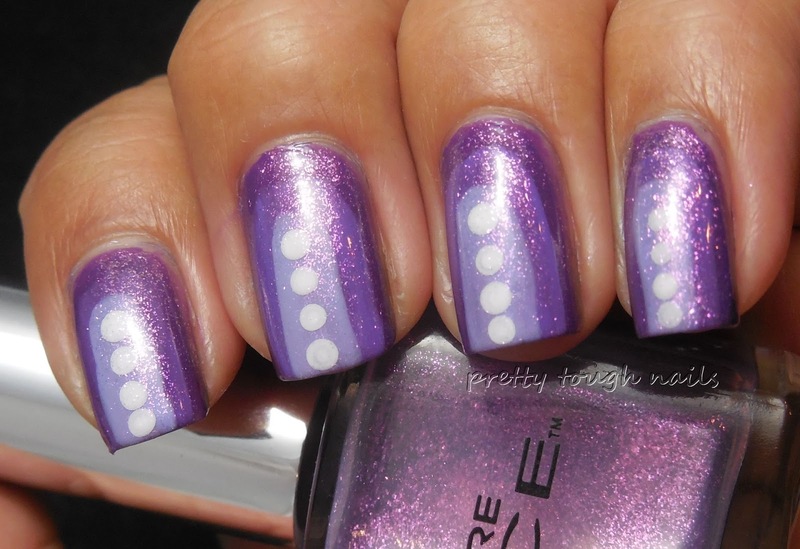 My light lilac-ish purple shade was Sinful Colors Candy Coated, and to finish I added some dots of Zoya Purity. I topped it all with Pure Ice Busted to add purple shimmer, and finished with a layer of NYC GCS. This mani was really easy to create and I freehanded most of it with the bottle brushes except for the dots, which I did with a dotting tool. If you're looking to do some nail art and you need something quick, this method is something you need to add to your arsenal. Pure Ice Busted is one of my favorite shimmer toppers as well, and I love how it sets off the entire mani. Thanks for checking out my day 6 purple mani! Please make sure you check out the other ladies' creations. I really like this look, very effective. thank you once again, dear! Thank you!! Busted adds a touch of glamour to any color! Really lovely! I just found your wonderful blog via the thumbnail links on the digital digits challenge going on now...I would love to follow you but I really don't use the options given...I look at my dashboard for bloglovin only when everything else is done so often it gets missed - it's tedious and I know many others find that as well...I have found since Google reader went goodby that subscribe via email works best...i always get through my email everyday and it works on every platform and browser anyone might be using. Love to see you add a follow or subscribe via email widget. Many bloggers have that now and it really does help...no matter what device you use you can always get to email. Why thank you!! I'm flattered. I will definitely add an email subscribe option on the sidebar like you suggested. I never thought of it before, silly me. I appreciate the recommendation! This is gorgeous Thithi! Purple is my favorite color, so this is perfection to me! I think you did an amazing job executing this. thank you!! it's so easy, you should try it some time! !